TeamViewer provides a web-based API that allows you to access data and control various aspects of your TeamViewer account. You can use the API to develop apps that integrate TeamViewer functionality into your own corporate environment or you can develop apps that everyone can use. 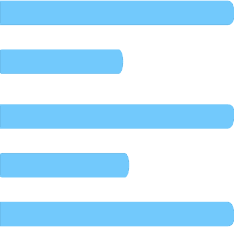 The API uses REST to communicate with your application and the secure authorization standard OAuth 2.0 to manage access to all data. Methods related to a TeamViewer company profile (e. g. create new company member, modify member information). Methods related to remote control sessions with TeamViewer (e. g. create new session, modify session information). Methods related to connection reporting in the TeamViewer Management Console (e. g. list connection reports, export reports). 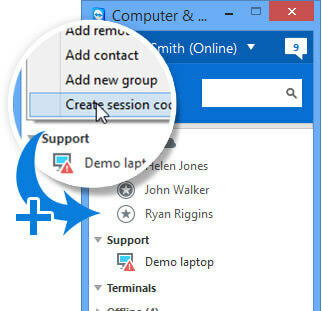 Methods related to the TeamViewer Computers & Contacts list (e. g. see who is online, start a remote control session with a contact or device, or batch import new contacts from your address book). Integrate a “Request a support session” button into your web application. Extract connection reports from the TeamViewer Management Console into Excel for further processing and generating statistics. Automatically export connections reports from the TeamViewer Management Console every night for offline and flexible usage (e. g. for billing). Quickly import the entire support team into your TeamViewer company profile. Automatically create a new TeamViewer account for every new user in your Active Directory. Start a meeting from within a chat app and invite chat partner directly. Schedule a meeting in a third-party calendar app. See if a contact from your CRM is online in TeamViewer and directly ask them to start a remote control session to their computer. Directly connect to a computer from within your favorite asset management system, using the password that is stored in your Computers & Contacts list. Developing your own application is easy. Follow the steps below or jump right into the API documentation. to get started right away. In the TeamViewer API, two different ways of using the API are distinguished: Either through Scripts or through Apps. Apps are developed to be used by many different accounts. 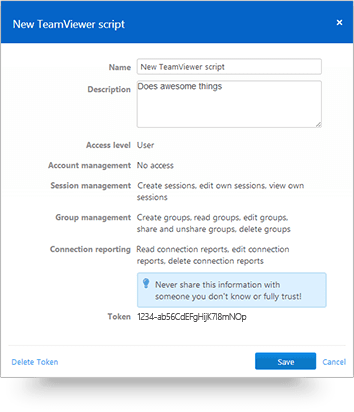 Because of this, Scripts and Apps have different ways of accessing TeamViewer data, represented by different types of tokens. If you want to use the API for your own data only, create a script token. Don’t worry if you change your mind later, you can still migrate to an App with ease. 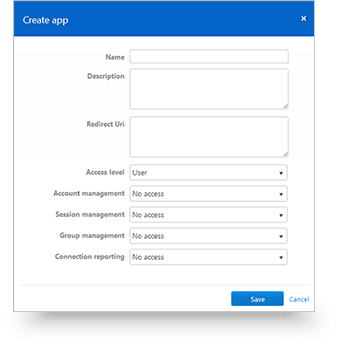 If you want to create an App to be used by other TeamViewer customers, go ahead and create an OAuth 2.0 Client ID. You need a TeamViewer account to use the TeamViewer API. The easiest why to do so, is to visit the TeamViewer Management Console website. Sign up for an account at the left site of the page. 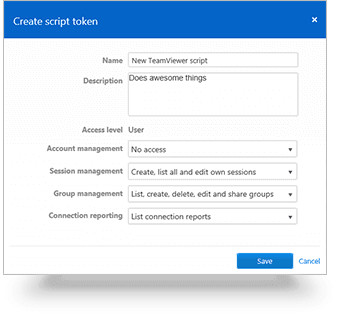 To create a script, you have to log in to the TeamViewer Management Console with your TeamViewer account. In the Console, open your profile settings in the top right of the website. Please find further information in the?API documentation. Write down the Token from the properties of the script you created recently. You will need the Token in the developing process. Please find more information about the Token in the?API documentation. You can now start writing your own script using the?API documentation. ?or you can use your token in one of our?example scripts. 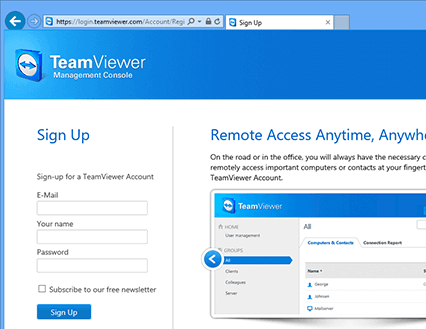 To create an application, log in to the TeamViewer Management Console with your TeamViewer account. In the Console, open the Apps link in the footer of the website. 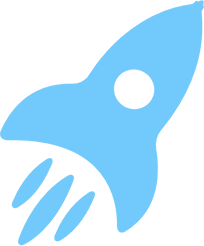 Users are redirected to the URI after granting your application access to their data. If set, only authorization requests will be granted that use the given Redirect URI. Can be changed later. 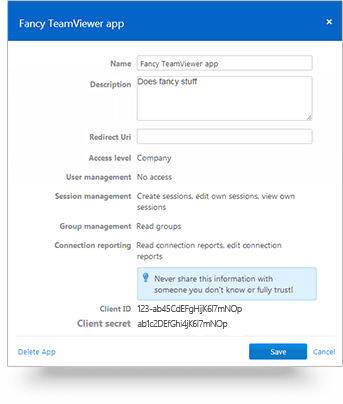 Write down the Client ID and the Client secret from the properties of the app you created recently. You will need them in the developing process. Please find more information about the Client ID in the?API documentation. You can now start writing your own application using the?API documentation. 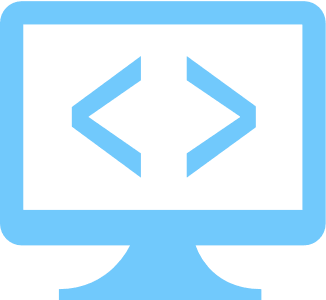 The documentation of the TeamViewer API provides a detailed description of the available methods (including examples for the method calls) as well as basic information on using the API. 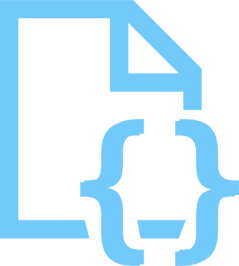 You can download the TeamViewer API documentation as a PDF below. We provide some pre-built scripts to help you to get started with developing your own applications. The scripts are available for?PowerShell?and?Python. Download the scripts for?User Management,?Reporting?and?Active Directory?or take a look at the examples below to get some helpful impressions. Please find further information about the used API methods in the?TeamViewer API documentation. With the service queue, you can manage customer support cases in your TeamViewer and the TeamViewer Management Console. This example provides an application that creates a service case. Using the attached program code you are able to comprehend how you can integrate the service queue features in your own application environment. You can download the app and C# code below.